How the bustling cityscape calms to a lucid tranquility on weekend mornings. Especially in a city like Seattle, there is almost a ridiculous impetus to forgo any type of late sleeping in order to best take advantage of the urban peace. 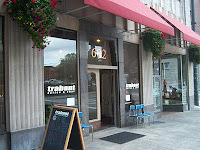 Naturally, I also had my drive to find a good brew in the great coffee-tropolis, and hence I found myself standing at the front doors of Trabant Coffee and Chai first thing on a Saturday morning. The coffeehouse had just opened and my pal and I were the only souls present aside from the lone barista. The cafe is cavernous, with an open yet extremely well-constructed seating arrangement with vintage globe lighting. I ordered a cup of Guatemalan Finca El Jaibal via their Clover, as well as a shot of Epic Espresso (both coffees from 49th Parallel). The El Jaibal produced nuttiness with a croissant buttery-ness, chocolate chip, some oolong and grain; a great balanced Guatemalan coffee. The Epic demonstrated well, with some cocoa, whiskey kick, pepper, sweet raspberry and a little smoke, all of which was embodied in a short pull with good crema. The tea is free leaf. The tranquility of the early morning paired well with Trabant's wares. But even if the streets were overburdened with people, I would still make my way back. Get on down to Trabant if ye be in Seattle. You could really comment on a coffeehouse can you? I love how you do this for a living. I might as well do it in my country as well. Hop to one coffee house to another and blog about them.